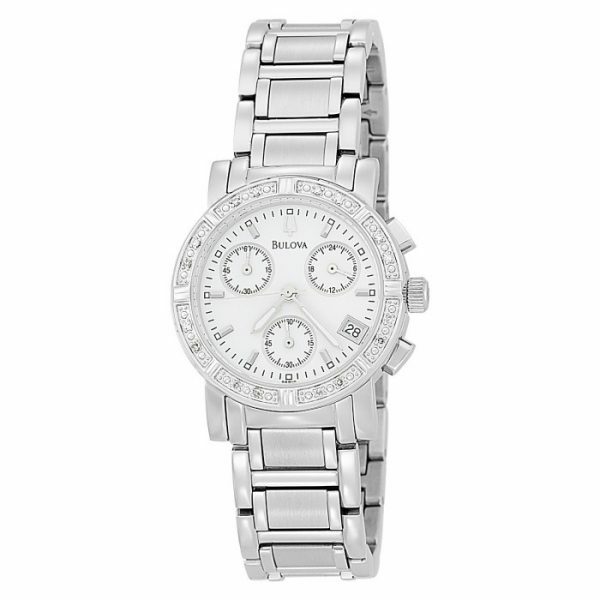 Sixteen diamonds frame a white pearlized dial in this elegant dress chronograph from Bulova. The perfectly round dial features luminous hands and markers, a stainless steel seconds hand, and a date window at the four o’clock hour. Three subdials display small seconds, minutes to sixty, and 24-hour time. This watch is set in a stainless steel case and presents on an attractive steel link bracelet that fastens with a invisible-double-locking-clasp. This Bulova watch offers precise Japanese quartz movement and is rated water resistant to 30 meters. Bulova introduced its first line of wristwatches in 1919. The company grew and prospered, and soon early radio and television ads were declaring, “America runs on Bulova time.” In the 1950s, continuing its legacy of innovation, Bulova introduced Accutron, the first electronic watch, and the first breakthrough in timekeeping technology in over 300 years. The Accutron timing mechanism was later adapted for use by NASA computers and a Bulova timer was even placed on the moon to control transmissions of data. Bulova timepieces have kept official time aboard Air Force One and have also served as official timepieces for U.S. Olympic teams.